Our updated intranet design went live in January. Here you can see 24 screen shots. 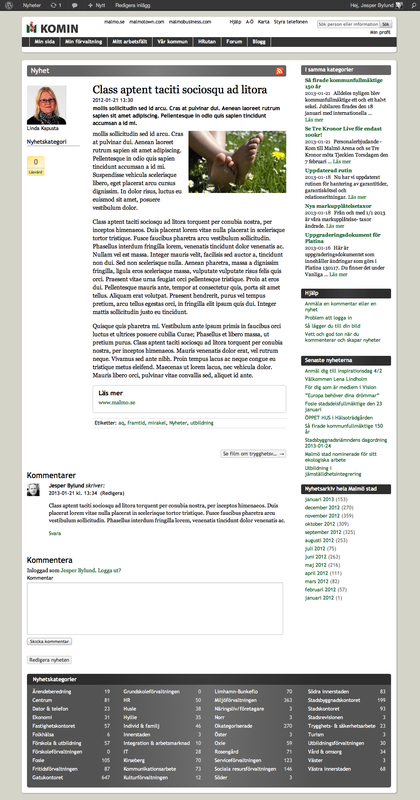 Besides adjusting the masthead we also improved our news pages. The news pages on the intranet provide the employees with info about changes that affect the working day, they speak about what is important right now. In my blog post A new take on intranet news I wrote about the changes we made in 2012, when we introduced comments on the news pages. Now you will read about iteration #2, some nine months later. In the January design change we increased the focus on the news story and reduced some noise on the news page. The new news page in a smartphone. The main task of a news page is to tell you about changes in the organization that are important for you to know in your working day. This task remains after the design change. For this reason, the greatest focus on the news page are the header and preamble, both in the old and new design. Directly under this, we have the text body. Further down the page there is the comment field. News pages differ from other pages. News pages have an expiration date that is often just one or two weeks from the creation date. After this, the event the news page talks about has occurred—and the page stops being relevant. News pages are characterized by constant change and should be sorted according to creation date, newest on top, to give good support. For this and other reasons we create news in WordPress. This tool, originally for blogs, is excellent for newest on top sorting. Wordpress is also excellent for handling comments on posts, the ability to comment on a news item is a natural companion to news. The possibility to easily batch remove old news also speaks for WordPress as the news creation tool no 1. We have no news older than 11 months on our intranet—because when they become one year old they start to destroy the search engine quality. The big change on the news pages is that the right column is greatly shortened compared to the September iteration. It used to have more than 30 links (5 more news blurbs based on categories for the news item on the page, 4 help links, 10 latest comments, 12 archive months), but now it only has five “further reading” links. These five blurbs are community-wide “Our ​​municipal news”, relevant for everyone. 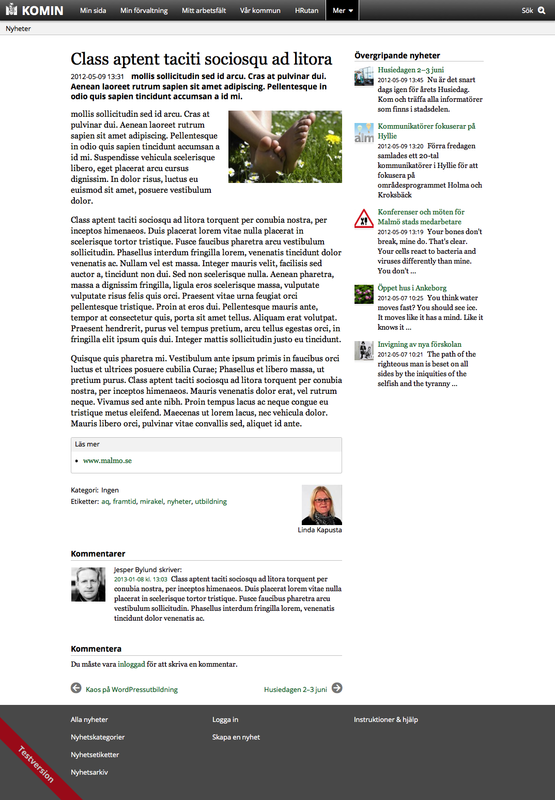 The right column links were introduced in September and this was an improvement—the news page originally was a dead end. But we have realized that 30 is too much—a bit less is more. 🙂 The old solution of news blurbs based on the categories of the current news item had a tendency to send people to other news posts that was not relevant. Categories and tags have moved to below the news item. We also have less focus on the author, and have moved it further down as well. The comment section has the same width as the news body, in the old version we had an unnecessary jump to the left when the comments began. The Like button has been removed. It was not used to any great extent. We will evaluate whether we should have some kind of Like button for news in the future and if another graphic design for this might work better. The news pages has a footer where we have gathered help, navigation to all categories and labels, news archive, etc. All this content is secondary compared to the actual news item. And of course the new news pages are also responsive, so they fit beautifully in a smartphone. Thanks to the January adjustments in the News section, we use the news page more effectively. Look at the examples above—it is the same content on both pages, but the page in the new design is 25 percent shorter. Also, the need to get the news pages into the smartphone gave us more of a “Mobile first” approach in the desktop version with greater focus on the most important content. We have fewer secondary things exposed directly on the page, and this, together with moving the author, categories and labels downwards, makes the page less “noisy”. We get a greater focus on the news content – just what the page is for! This allows Komin to give the employees better support and make them more effective in their work—the goal of the intranet.